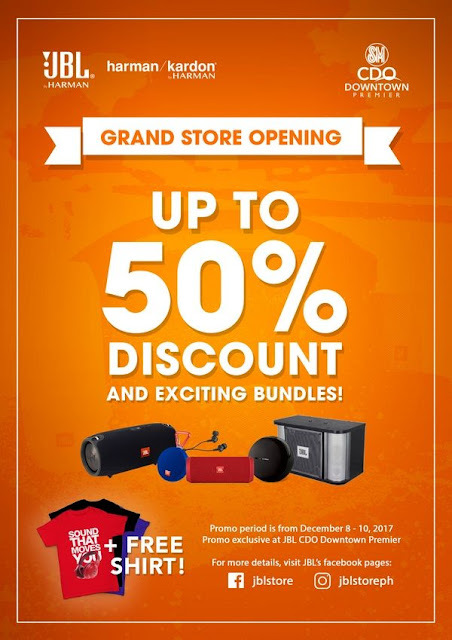 JBL Philippines will officially launch their Cagayan de Oro Branch tomorrow, December 8 until 10, 2017, at SM CDO Downtown Premier. With this, they announced that they will be having promotions exclusive for Cagayan de Oro shoppers. Cagayan de Oro shoppers will be able to avail up to 50% OFF on selected JBL products and exciting bundles. They will give out FREE limited JBL t-shirt for a minimum single receipt purchase of JBL products worth PHP 5,000. This offer may not be in conjunction with other promos. For more information, please visit their official Facebook Page at https://www.facebook.com/jblstore today!